We usually undergo a long transfers from one end of the country to another or between countries or continents typically in the summer months, when holidays and school holidays take place. Long travel by car, bus, train or plane becomes for each passenger the worst part of the holiday, but it is the biggest "suffering" for our kids. It is for them and because of them we should be well prepared on the road in order to pass the journey quickly and without any unnecessary misunderstanding. Getting there is usually more difficult for children. Packing luggage and adult conversations about the whereabouts upset them, especially if there is a disagreement in some families. On one side they are excited, but the very fact that they are going somewhere far away is very stressful idea. Therefore, this phase before the journey should take place without the hustle and in peace. Make children familiar with all the details of the journey, even with those that in our view seems like irrelevant information for them. Invite children to actively participate in luggage packing and ask them to prepare their favorite toys which they would like to take with them. Since children have no idea what awaits them on holiday, toys are their confidence and they feel that the more toys they will take with them, the more they will resemble home. Sit down with child to the pile with chosen toys and together, with great patience, sort out the toys and reduce them to a reasonable number. Tell them, that they certainly will want to bring some souvenir, so it will increase the number of toys again. What toys are for the journey? Plush toy. The best is the size of 20 to 25 cm, so the child is able to carry it by itself. Practical are baby plush backpacks, representing a pet. These serve as storage for other toys and can be used as a potential cushion while waiting at the airport. Book. For smaller and larger children you should have all encompassing encyclopaedic book with pictures. It provides a large number of articles, not only to read but also to observe. Fairy book has no meaning. We can tell it. We can use imagination and as a basis for our fairytale we can use theme from encyclopedias. Also, we ask child to come up with own story and in turn, told the fairytale to us. For 2-3 year old children is great fun to watch toy catalogs. Social games. They are more appropriate for older children. It should be noted, however, that the child can not play with them alone. Therefore, we take social games only when traveling by train, plane - in the case of longer waiting for departure. Color pencils, drawing paper pad. For greater security are better thicker, not very sharp color pencils - such as crayons. Do not take them to the aircraft. Some airlines, especially for longer flights, have prepared gifts for children that contain the appropriate needs for drawing- coloring books, paper puzzles and the like. Toys consisting of a large number of small parts are not suitable. They can be easily lost. Child is constantly looking for them, requesting our assistance. It causes nervousness and inattention, which, especially when traveling by car, may endanger our health and the life. Bag should always be at hand, to reach it without stopping. Food and drinks are essential for the long journey by train or bus. When traveling by car, you should take less food. It can be bought in a fast food and gas stations. Do not take food on the aircraft, you usually get a snack on board. Ask the airlines about the number of drinks that children need to take on a plane. We pack plastic and paper plates, plastic cutlery and cups, pocket knife and tin opener to the bag with food. Do not forget the cleaning supplies - wet napkins, paper towels, napkins, antibacterial hand cleaner. Depending on what transport we use, adapt their quantity. We should also have a flashlight and basic drugs at hand (for motion sickness, pain, cleansing nasal spray). Children suffering from nausea should take medications before the trip and should not eat heavy foods including dairy products and sweets 24 hours before you go. 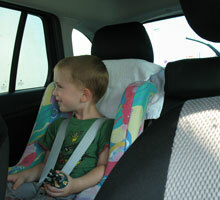 We use the statutory child seats in the car according to the child's age. It is to be considered whether it would be appropriate to take, especially for a small child, adjustable seat for a long bus ride in case that bus stops near holiday apartments, hotels. When traveling by train, if possible, use carriages for mothers with children. Crying child should not be a problem there. 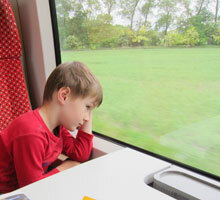 The safest place for a child on a train is in the middle of the coach and seat in the opposite direction of the road. When traveling with children, you will appreciate a small blanket and pillow. Let children feel comfortable on the road. Put a flip table on the backrest of a child's seat where he/she can draw, play and eat. Stop often times. Stopping increases the journey time, but child, if it is not asleep, should walk every 1.5 hour. The journey will be more interesting if you stop near the various attractions, sights, or let the child just play around at the rest area. Portable DVD player with popular fairy tales, tablets for larger children, electronic games and audiobooks are suitable for long journey. Maybe we do best if we bring notebook in which you play a story, child can play a game, read a book or listen to audiobook. Spend more time with children after the journey. To pass the time you should talk, actively follow the surroundings, teach them to know the traffic signs, play word games, sing. Nowadays, you can not get along without air conditioning in the middle of the hot summer. But use it wisely. The difference between external and internal temperature should not be more than 5 to 7 ° C. We can not affect the air conditioning in the airplane and bus. Therefore, it is advisable to have a warmer clothing ready. In many air-conditioned trains you can directly regulate the temperature in the compartment. Getting there usually seems longer. Way back passes much faster. Children sleep more. Impressions and feeling that they are returning home calm them down. They have a new toy, and a head full of holiday experiences. On the way back there is no need for frequent breaks, just stop every 2.5 to 3 hours.